Tottenham Hotspur have had revised plans for a new stadium approved by Haringey Council. Spurs hope to move to their new 61,000-seat home for the 2018-19 season. The planning proposal featured aspects tied in to a deal that will see at least two NFL matches at the stadium each season in a 10-year period. The plans must be formally approved by the London Mayor and the current incumbent in that position, Boris Johnson, is a fan of the project. "Stadium Update: We can announce that Haringey Council's planning sub committee has approved the club's new stadium proposals," the Premier League club tweeted. 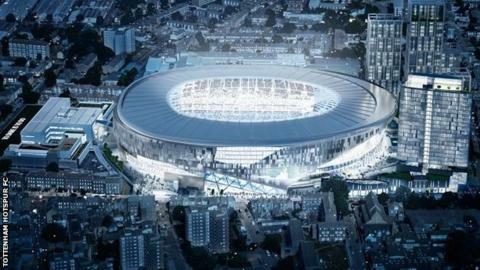 The stadium will be built as part of a development that would also include the land their current White Hart Lane ground, which has a capacity of 36,240, stands on, with work due to begin in spring 2016. "A key driver of the design of the revised scheme has been to address and improve crowd safety and crowd flow issues along the High Road," a recent Spurs statement explained. "This issue has long been a concern for the club and is largely caused by the location of three buildings on the High Road: Edmonton Dispensary, The Red House, and the former White Hart Public House. "The current planning permission does allow for increased space behind the three buildings but the crowd flow modelling shows that spectators would be much more likely to continue to take the most direct route along the High Road, with people regularly moving into the bus lane and the road. "Given the increased number of spectators, not simply for football but for the NFL and other visitor attractions, this is simply not a situation the club can accept." Tottenham intend to play away from their home ground for the 2017-18 season "to enable a faster construction of the new stadium" before opening it in time for the 2018-19 campaign.